By age 50, about 50% of substantial number of men and women-are affected by hair loss, much of which is hereditary.In men,he most common condition leading loss is called male pattern hair loss. This affects only front & top of head. Hair transplantation surgery involves transferring the hair follicles from the donor area on the back and the side of the head,which has genetically strong hair to the balding areas. Hair Transplant does not increase the total number of your hairs in the scalp because here we redistribute the hair from the back in such a way that you grow sufficient hairs on the hair loss area to look good without the Donor area looking bad.We use the roots of this permanent hair and graft them in the area where you have lost your hair.This can be done in two ways FUT and FUE. 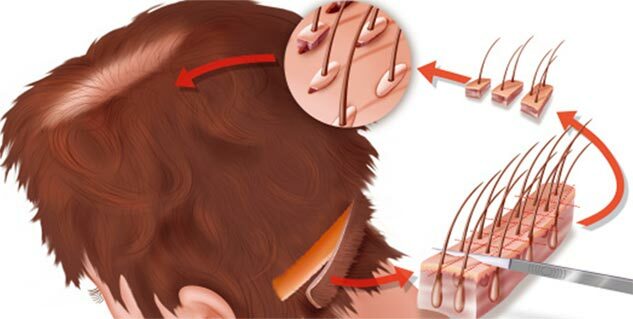 The FUT hair transplantation or the strip method is surgery is the older method that involves removing a narrow strip of hair-bearing scalp from the back of the head and using it to fill an area with thin or no hair.. After removing the strip of scalp with a scalpel, the surgeon closes the scalp.This area is immediately hidden by the hair around it. Next, the strip of removed scalp is divided under magnification into into multiple tiny grafts containing an individual hair or just a few hairs each. The number and type of graft used depends on the hair type, quality, and colour as well as the size of the area where it will be transplanted. Then the surgeon cleans and numbs the area where the hair will be placed, creates holes or slits with a scalpel or needle, and carefully places each graft in one of the holes. The FUE or Follicular Unit Extraction or root extraction is a minimally invasive hair transplantation technique in which follicular unit grafts (hair follicles) are individually removed from the patient’s donor area and then individually transplanted to the recipient area. Follicular hair extraction (FUE) technique, is the latest and fast becoming, the most popular method of hair transplantation. In this method, the follicular units (hair roots) are extracted as individual units and then transplanted, the advantage being minimal or no visible scarring in the donor area.These are removed using a power tool and then placed in the recipient area. The advantage is that there is no linear scar and no stitches are required, so the donor area will be minimally noticeable within just a few days and this technique is useful for men who want to keep their hair short. The patient lies with the face down on the operating table. The scalp is cleaned and a local anaesthetic is applied to it. Your surgeon may choose to give you oral or intravenous antibiotics before and for a few days after the procedure. Once the local anaesthetic has taken effect, the surgeon takes out grafts from the donor area using fine micropunches. The grafts are stored in saline solution and then grafted in the planned area. After hair transplant,you may need to take pain medications and antibiotics for few days. Your surgeon will have you wear a surgical dressing over the scalp for at least a day or two. Most people are able to return to work two to five days after surgery.The results of hair transplant are generally satisfying. Sometimes additional sessions are needed if you continue to lose hair or decide you want thicker hair. And this is why you must try the latest hair color trend, hair strobing.